The words were centered on the title page, written in red ink. It should have been ominous. It should have kept Meg from turning the next page.Not so much.The word (review) was my own addition. Who ever listens when told to stop doing something? The words "keep out" aren't much different from waving a red cape in front of an angry bull. It only dares us to charge right in.You know, I can't even fault her for doing it. If people were dropping like flies all around me (this is not a spoiler...I will try not to go much further than what the summary is going to tell you anyway), I'd probably be looking around for clues myself. Either that, or crafting a fine raft made out of household items to get myself off the damn wretched island. Either/or. It's a toss-up. I'd probably leave the sleuthing to the experts and try to run from the crazy killer.Vengeance is mine.If you've read any reviews on this book already, you'll have figured out that the inspiration was Agatha Christie's classic And Then There Were None. Since we can liken Ten to a re-telling of ATTWN, I'll say it wasn't a bad effort. The murder scenarios might not have been as crazy or scary as I would have preferred, but I give credit to the author for tackling the project and pulling it off well enough. In cases like this, I'd love to see what kind of notes the author must have been taking in order to keep track of everything.The first 25% or so of the book felt a little dead behind the eyes. All of the teens arrived conveniently on the island (because sure...all 10 of them lucked out and were able to go - what a fabulous coincidence!) and some of the mix-n-mingle part of the book had me skimming. Not that it was boring; I just wasn't in the mood for learning about 10 characters who might most likely die. It's probably not a good idea to skim anything that could be laying groundwork for a murder mystery, but I like to take chances. If you have read ATTWN before, you'll sort of know at least part of what's going on, although there are a few twists to change it up just a little.I'm also going to go out there and say that there had to be a nod to the t.v. show Harper's Island in here as well. The show HI was sort of a very loose interpretation also of Christie's book, except more updated for the new generation of horror movie fans. I smiled at the name Henry Island because that was the name of the lead character from HI. Although, I'd almost wondered if that was a placeholder name because everywhere else in the book, the island was called by another name. A few of the character similarities also echoed the show. NOTE : BTW...if you get the chance, get a hold of a DvD copy or stream this show on Netflix. It's even more fun if you watch the show with other people and place bets on who the killer is.As well, it was as if every major horror movie that had come from the past couple of decades (especially those appealing to teens) had been picked/borrowed from just a little. One major scene was almost dead on identical to a scene from the movie The Ring. I think this must have been the author's way of paying homage to what has come before because both The Ring and Scream were jokingly referenced in the book.There's only a few small complaints about an otherwise decent book :I hated the way the main female character defended her abusive friend (she was so blinded to the truth that it PAINED me).I thought the gay/racist comments were unnecessary. Making the comments okay because a character was allowed to have a comeback in order to confirm that the jokes were wrong sort of is an "eh" factor for me when the comments really didn't need to be there in the first place. If the story was about bullying or racism, etc. fine. But the comments were just random chatter in the middle of a murder mystery. It was a very small blip though in a conversation, so I don't think any ill intent was meant by the blip.I could have lived without the "killer vs. victim" scene where he or she (not spoiling of course) stands there and recaps their kills. Every friggin movie and t.v. show has this scene. Is this the standard? There has to be another way to bring the missing details into place without having to do it this way?Final Analysis : I think this would be a fun read for anyone who hasn't had the chance to read many murder mysteries and would prefer to be eased into the genre with something that's not too taxing. 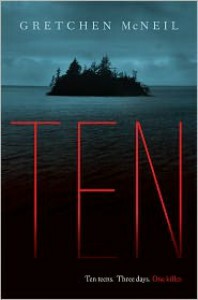 If this had been one of the first murder mysteries I'd ever read, I might have had more positive vibes about Ten. My average rating is only because I've seen this particular story done better before, but not because I think this book was bad or boring.If you are new to the world of murder mysteries, I'd say give to give Ten a shot. It's murder-mystery-light-beer : great taste, less filling (the book is fairly short and easy to read). But at least it's not incredibly scary or gory. If you can handle Hunger Games, you are perfectly fine to tackle this book.